Four 6’ 4” wide segments in this wall piece, Prairie Vistas, come together to depict a quiet expanse of horizon in the pastoral Ohio countryside. 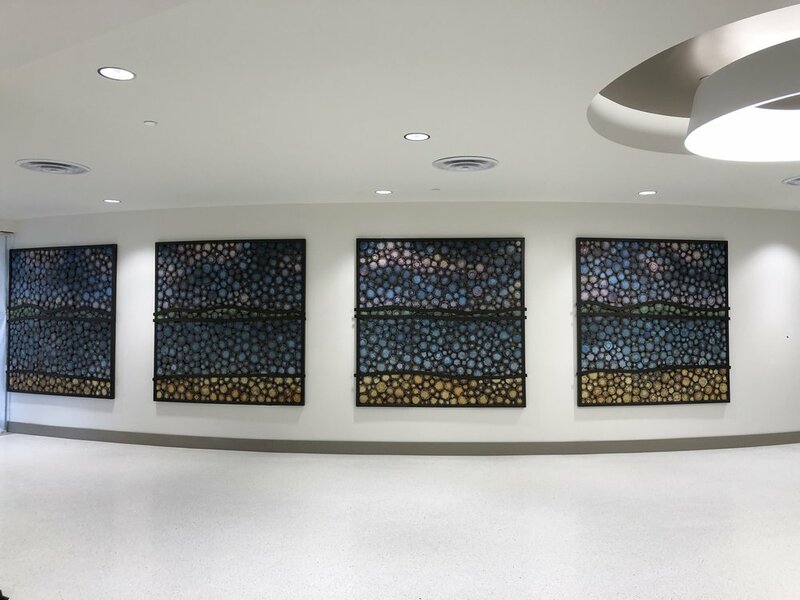 The landscape is composed of hundreds of medallions; each one forged and painted by hand, linked together to create a gentle, rolling backdrop for a bustling hospital corridor. Mount Carmel is a brand new state-of-the-art healthcare facility built from the ground up. This $355 million dollar, 500,000-square-foot, 210-room hospital in Grove City was built to replace the outdated 130-year-old hospital in Franklinton. 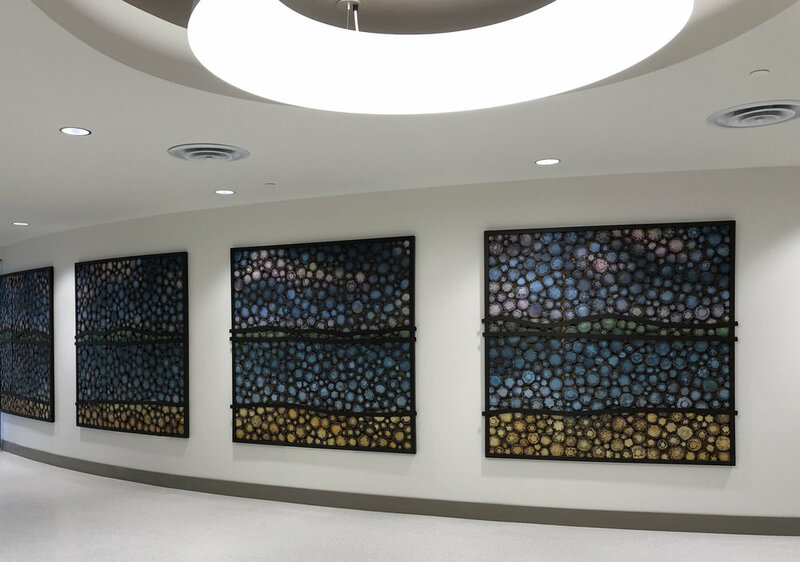 As part of the Trinity Health System, a national Catholic system of hospitals, it’s important for them to have artwork that expresses their religious foundation. 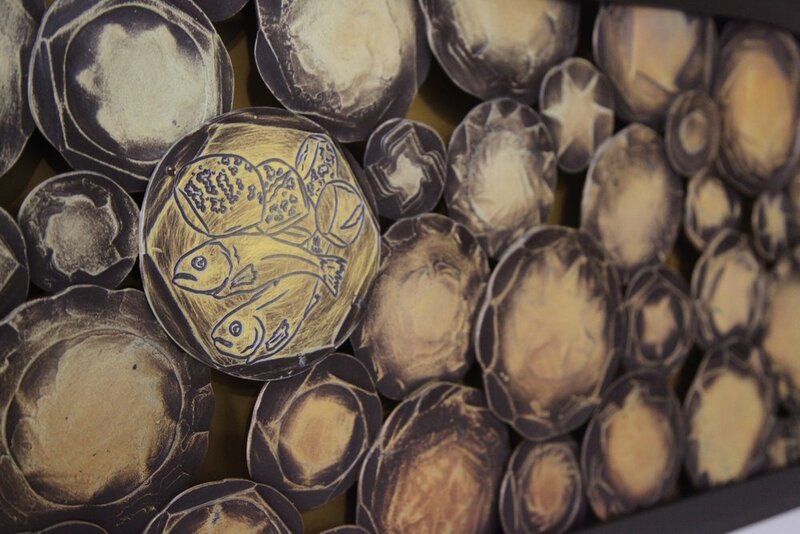 If you look closely, you can seek and find engraved icons exemplifying the parables; simple stories used to illustrate moral or spiritual lessons, as seen here (left) in a detail image of the artwork. 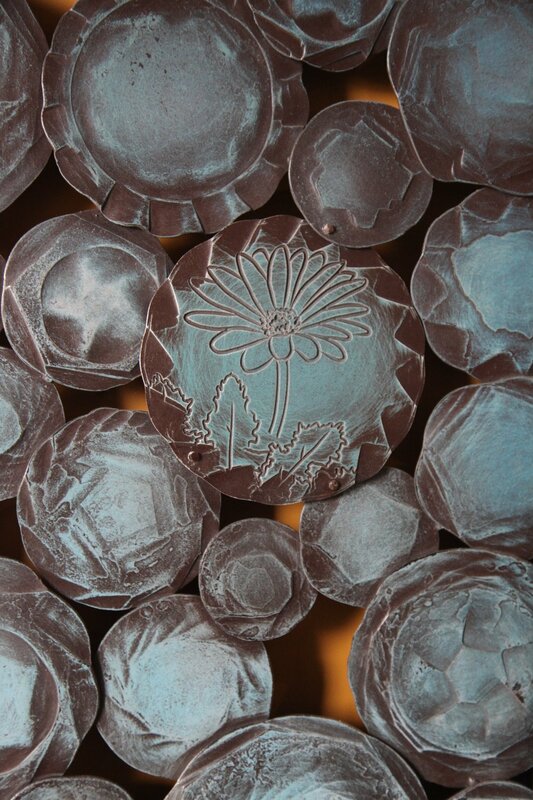 These engravings integrate spiritual elements, and also offer a fun way for people to interact with the artwork. Art in the healing environment provides a special purposefulness. It beautifies spaces, inspires calmness, and aims to kindle meaningful reflections within its viewers, but it also creates memorable moments that serve as way-finding guideposts within large or complex spaces. For this project we were asked to create two main design proposals, and the client then chose between the two concepts. We worked closely with the art consultant on details such as site placement, color palettes, and scope until we arrived at the final design. We worked with Idaho artists to produce digital renderings of the design proposals, as well as to illustrate the parable icons that were engraved into the artwork. 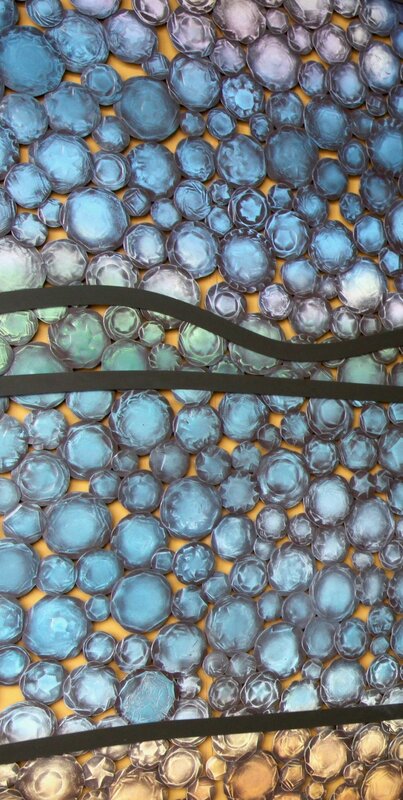 A corridor just outside of a dining hall was selected as the location for the piece. 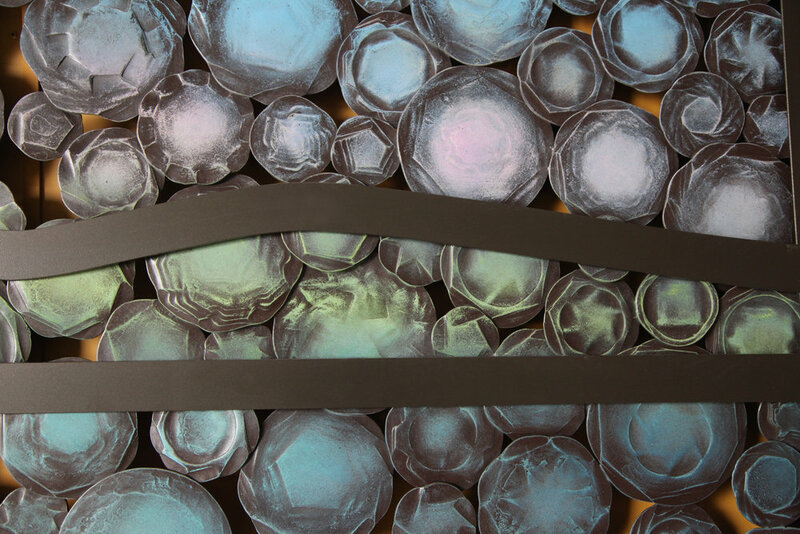 The wall where the art was to be installed is convex, and so we worked with the construction manager to take measurements and make a template, producing a final design that was made to follow the curve of the wall, so that the art would conform to the contours of the space. 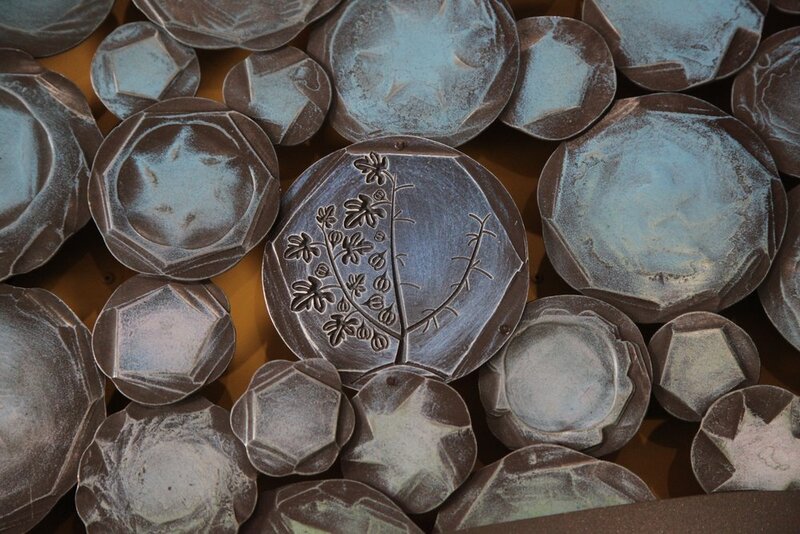 We worked with our own engineers to certify plans for artwork design and installation. Our team built custom shipping crates to transport the artwork from Idaho to Ohio and we flew in to receive the shipment and complete the two-day install.